IT was theirs to lose since the start and they managed to live up to expectations. SAN Miguel Beer continued its supremacy in the PBA's most prestigious tournament, holding off a gallant stand by Barangay Ginebra to capture a third straight PBA Philippine Cup title on a glorious Sunday night. Balloons and confetti rained down from the catwalk of the Smart-Araneta Coliseum as 20,217 fans witnessed the Beermen take the Gin Kings’ best punches yet still stood defiantly in the end as they hacked out a 91-85 victory to finish off Ginebra in five games of their title series. 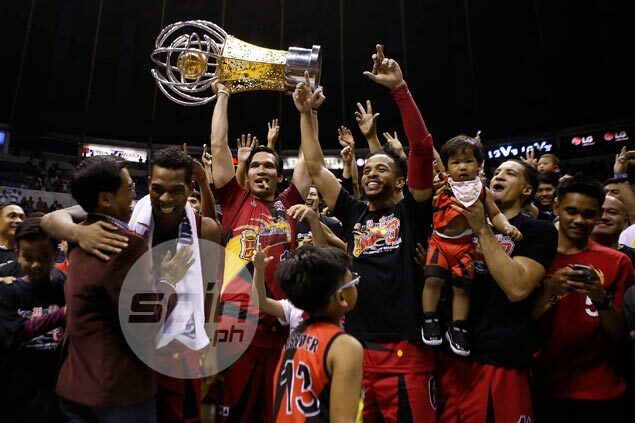 The Beermen captured the Jun Bernardino trophy, becoming the first team to take home the Perpetual Trophy for good since TNT KaTropa did the trick after ruling the all-Filipino tournaments from 2011 to 2013. Chris Ross sustained his impressive play on both ends as he flirted with a triple-double in the title-clincher, scattering 12 points, 10 assists, and eight rebounds along with six steals with less than two minutes of rest to lead a balanced effort by the SMB starters. Finishing the series with averages of a near-double-double of 17.2 points and 9.2 assists, on top of 5.2 boards, and 1.8 steals, Ross emerged PBA Press Corps-Cignal Finals MVP for the second straight all-Filipino conference. “It’s not an easy win for us, but, of course, our players, kita mo sa body language nila na they really wanted to finish the mission,” SMB coach Leo Austria said in the post-game conference. “At kita mo naman mga fans namin, kahit kakarampot yan against GInebra, loyal na loyal yan, kaya maraming salamat rin sa kanila,” he added. June Mar Fajardo again anchored the Beermen down low, tallying a team-high 21 points along with six boards, two assists, and one block, while Arwind Santos also tallied 21 markers on 8-of-11 shooting and missed a double-double by just two rebounds, adding two assists and two blocks. Alex Cabagnot kept the Gin Kings at bay throughout with his timely jumpers, eventually finishing with 18 points and four assists, while Marcio Lassiter replicated Ross’ efforts on both ends as the SMB sniper chipped 12 points, three blocks, and one steal, along with two boards and two assists. But it was Ross who shone brightest, typifying his super two-way play with a reverse putback layup that gave the Gin Kings an 89-83 lead before grabbing a defensive rebound in the next play that practically sealed the deal for the Beermen. So instead of the Gin Kings, in the presence of Ginebra legend Sonny Jaworski, living up to their never-say-die reputation and extending the series to a Game Six, the Beermen closed it out the way they were expected to. SMB 91 - Fajardo 21, Santos 21, Cabagnot 18, Ross 12, Lassiter 12, Espinas 4, Tubid 3, De Ocampo 0. Ginebra 85 - Aguilar 26, Devance 20, Mercado 20, Tenorio 10, Marcelo 4, Thompson 3, Caguioa 2, Ferrer 0. Quarterscores: 27-21, 51-41, 63-61, 91-85.